This is where they discovered Twiggy. 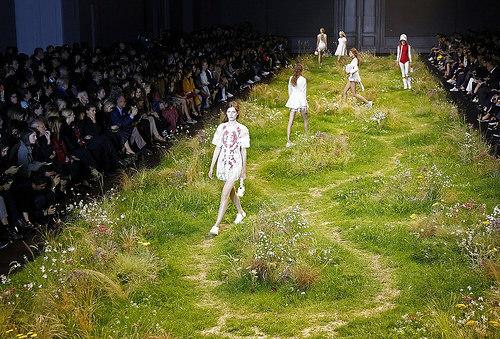 A catwalk in the park. They've been out picking Burberries. When models reach a certain age, they are put out to pasture. "Give us something new to show off our spring collection." was the artistic director's remit. It was clear he'd done his groundwork. Wow, so this is how they make crop circles? Repeated walking over helps stamp out Kate Moss. Met Office report: all models predict ‘bright and cheery’ days will give way to ‘dark, stormy and hangry’ winter. The Shelsea Flower Show was disrupted by protesters against plant cruelty. No biggie. Just a meerkat walk. That's why models often sound slow. They're always on grass. A fat model is forced to take a walk of shame around a number eight. Steps. The live show. Rather dull. Some things in the garden do grow a bit leggy. Fights often take place if they stray into each other's territory on their nightly prowls. When Kate took up modelling I warned her to keep off the grass but she wouldn't listen. Say what you like, it keeps the crows off. Clothes horses love oat couture. ♪Underfed,overgrown, wombling free...the models of Wimbledon,common are we.